John Miller (his Father) and Micheal [Sowers?] were cousin. He married [Grumbling?] Grandmother Mower's Father Posey - (English name) Micheal [Sowers?] wife Sarah Ann. (his mother [illegible] cousins Her name [Grumbling?] 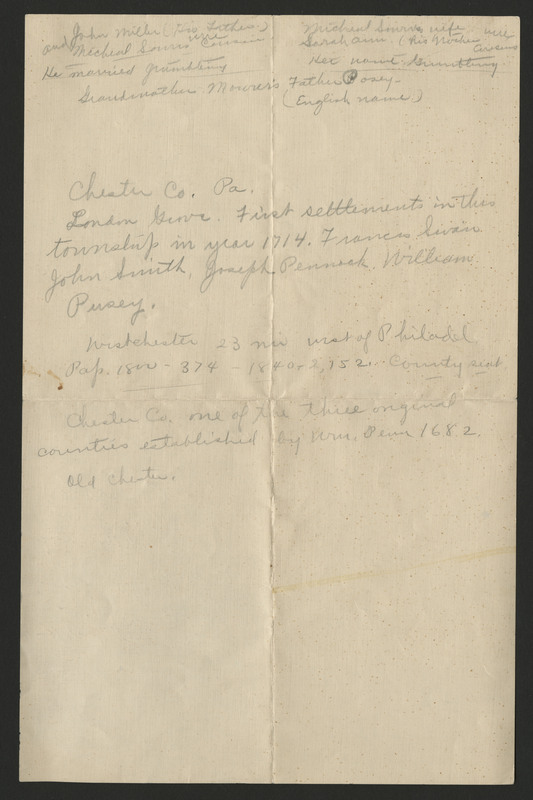 Chester Co. Pa. London [Grove?] First settlements in this township in year 1714. Francis Swan, John Smith, Joseph Pennock, William Pusey. Westchester 23 mi west of Philadel. Pop. 1800 - 374 - 1840 - 2,152 County seat Chester Co. one of the three original counties established by Wm. Penn 1682. Old Chester.